This post is sponsored by the National Frozen & Refrigerated Foods Association (NFRA). 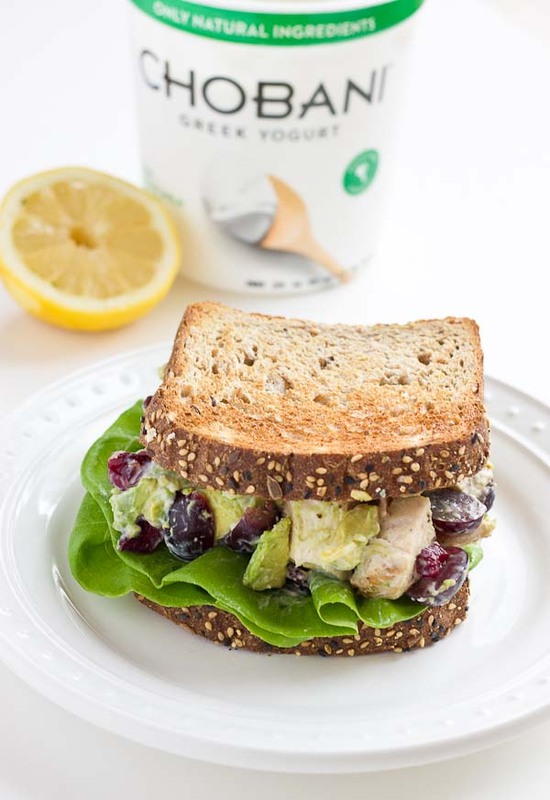 Bacon Avocado Chicken Salad made with Greek yogurt, cranberries, grapes, red onion, lemon zest, and honey. 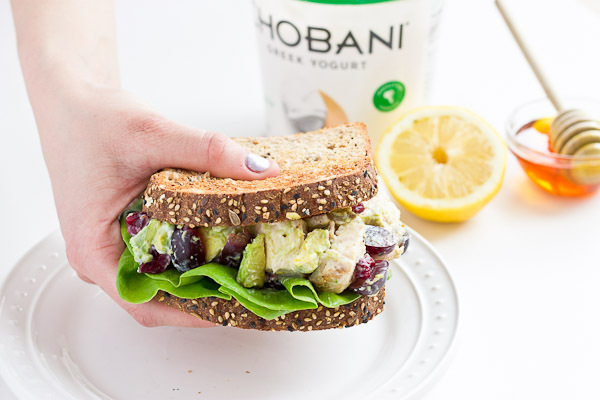 This healthy chicken salad makes an easy lunch recipe! Everyone needs a good healthy chicken salad in their recipe box, and this one rivals at the top of the lists of my favorites. Because come on, the sweet and savory flavor combo of this recipe is what dreams are made of! This salad is dressed with a zesty lemon Greek yogurt based dressing, with health in mind and to pack a bigger protein punch. I used whole milk Greek yogurt in this recipe because I still wanted all the yummy flavor and fullness factor that dairy fat has to offer. Chobani Whole Milk Plain Greek Yogurt, is made with 4% milkfat and contains live and active cultures that are good for the gut. It’s a wholesome choice that will make you feel good from the inside out. 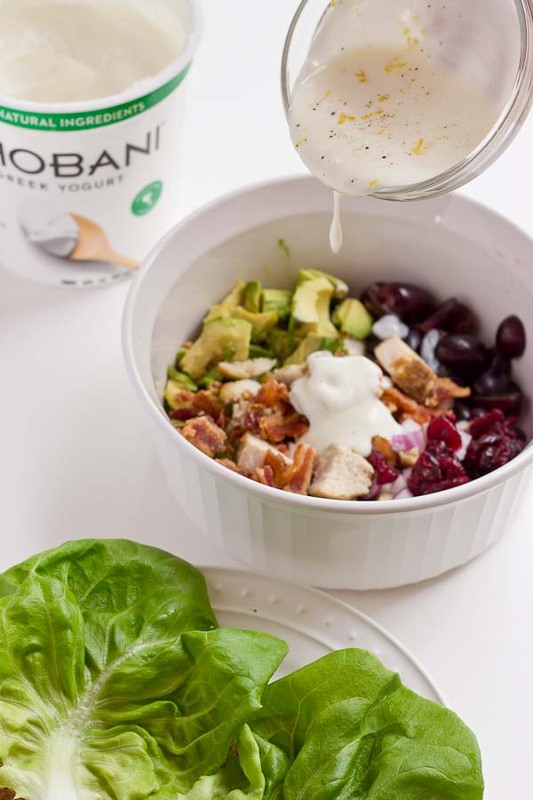 So let’s give thanks to the Greek yogurt for giving this healthy lunch recipe a whopping 26 grams of protein per serving! Wowza! How to keep avocado from turning brown? 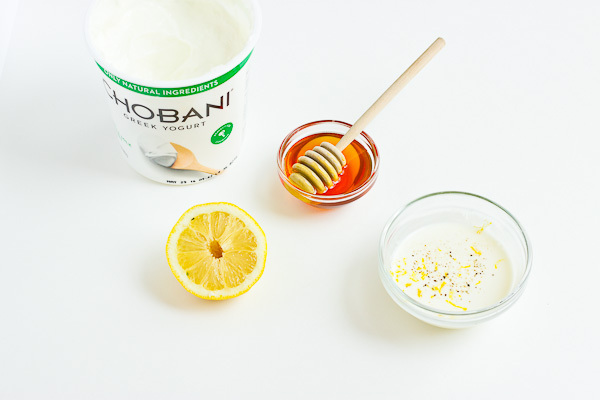 Greek yogurt + lemon juice! While I love eating this salad fresh because the bacon is crispier, you can absolutely use this recipe for meal prep. 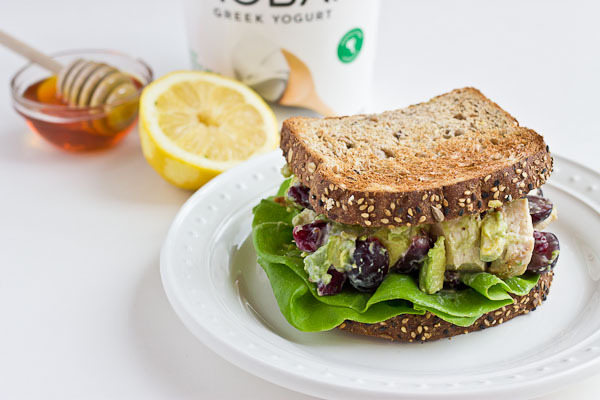 Another perk of the Greek yogurt is that, combined with the lemon juice, it helps keep the avocado fresh! Because what’s worse than making something yummy only to have the avocado turn brown in no time?? 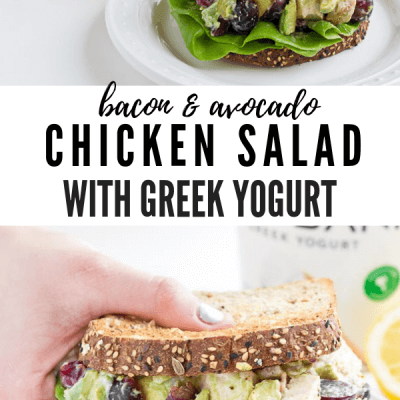 How to make Greek yogurt chicken salad? TIP: for the bacon in this recipe, I suggest using crispy bacon 🙂 for an easy and cleaner way to cook bacon, check out this post on How to Cook Bacon in the Oven! Ways to serve this healthy lunch recipe? Over greens. For a lower carb option, serve this recipe up over a pile of your favorite greens – spinach, romaine, iceberg, or a spring mix! As a wrap. A great and convenient way to enjoy this recipe two times in one day! Eat half for lunch and half for dinner, doesn’t get much better than that friends! 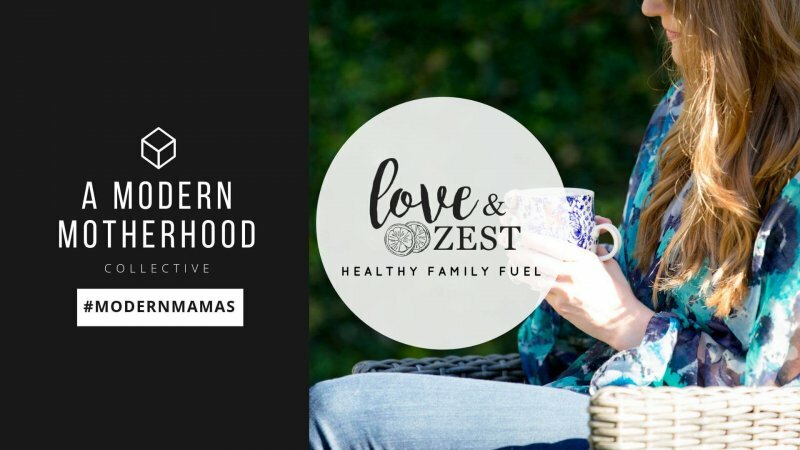 What’s your fave chicken salad recipe on L&Z?? 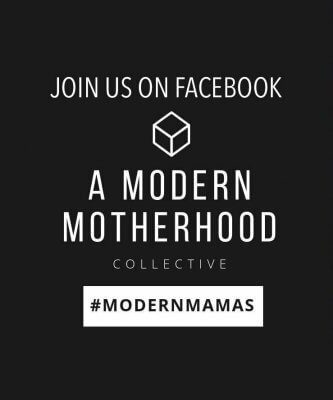 I’d love to know of the ones you’ve tried so leave me a comment and let’s chat! Bacon Avocado Chicken Salad with grilled chicken, bacon, avocado, Greek yogurt. 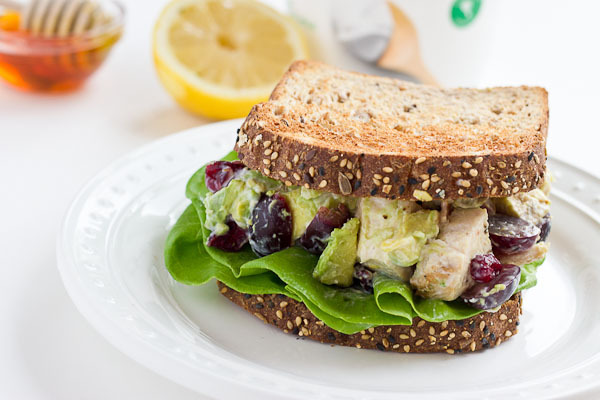 This healthy chicken salad makes an easy lunch recipe! 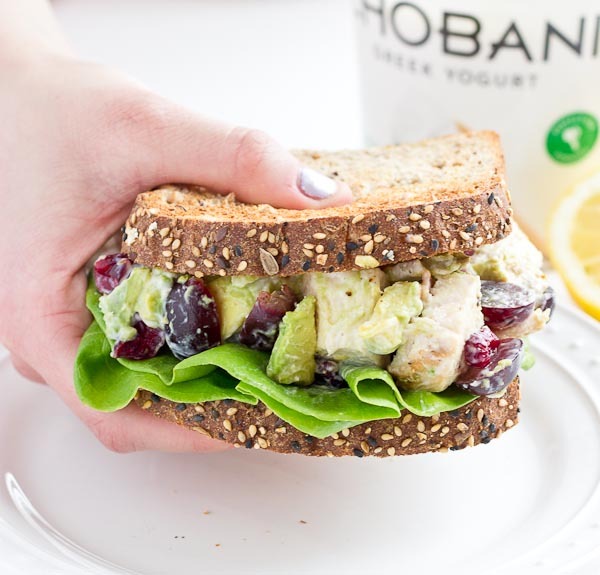 In a large bowl, combine bacon, chicken, avocado, grapes, cranberries, and red onion. Serve with crackers or on toasted sprouted grain bread with bib lettuce. « Parker’s Trip to Disney! Using yogart is great and the salad is delicious but you need to eat it right away otherwise the avocado makes it turn brown making it not pleasant to look at, although it still tastes good. Oh this is a the perfect spring recipe!!! I haven’t made anything like this in awhile, but it’s so easy, I’m adding it to the to do list! 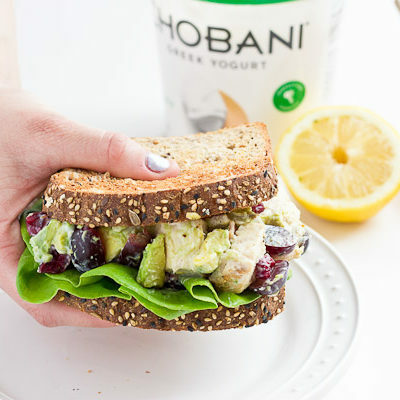 Love the idea of using greek yogurt instead of mayo!! Just a great replacement. 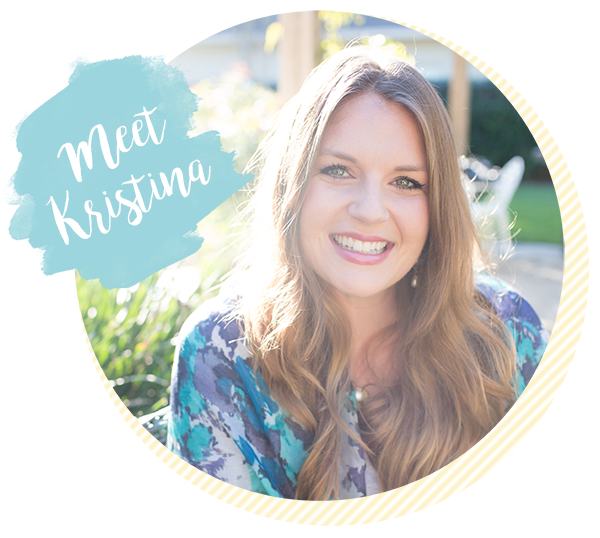 OMGosh Kristina, that is the BEST looking chicken salad I have ever seen. Looks SO hearty. I have started using non fat Plain Greek Yogurt for a ton a savory applications and it is amazing how much it can mimic mayo or sour cream. Loving it. I think we will try this recipe for lunch tomorrow. Thanks for sharing! Thank you and you are welcome!! I agree, Greek yogurt is amazing.